Designed with the sensor directly mounted onto a PCB, the innovative MTS-360 Sensor/PCB Combo package allows engineers to easily install a fully featured rotary sensor without first having to design a printed circuit board for the sensor. The result is time-savings and convenience. 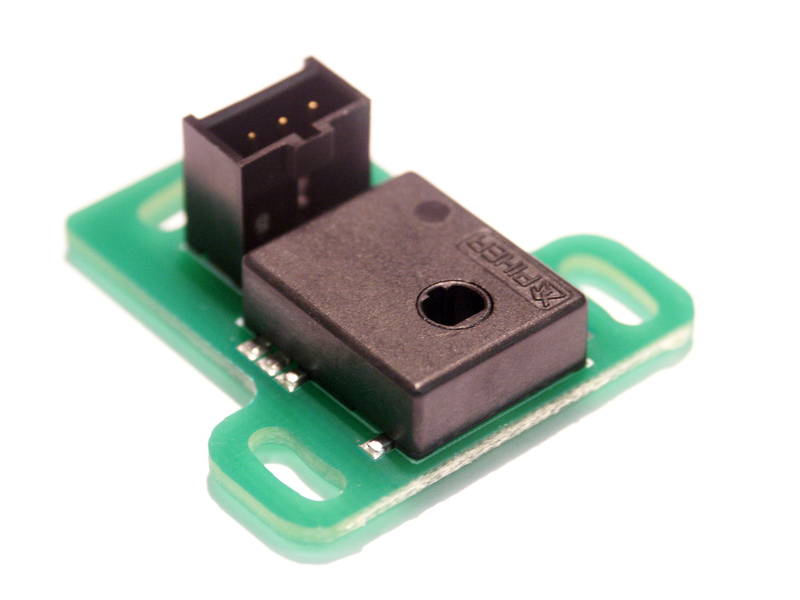 The MTS-360 Sensor/PCB assembly is available with either 6 pin (dual output) or 3 pin (single output) Molex 90119 Series mating connectors. The PCB / Sensor assembly can be easily secured with three standard M3 screws. The entire assembly measures just 35mm wide by 36mm long and 7.5mm high, allowing for applications with tight packaging constraints. The new MTS-360 Mechanical Mount sensor model incorporates all the breakthrough sensor technology performance features of the original MTS-360 by merging a through-shaft design with 360º absolute position feedback in a small size package. The result is an extremely small, fully featured rotary sensor with reliability up to 50 million cycles. The MTS-360 relies on patented Hall effect technology to enable true non-contacting through-hole shaft sensing now using a simple three hole mechanical mounting. The standard model features a 4mm double D-flat through-hole and three slotted mounting holes allowing final rotational adjustment at assembly. Performance features include electrical angles up to 360° with no dead band and linearity as low as ±0.5%. Rated for use at -40ºC to +125ºC environments, the sensor can operate up to 333 RPM and can be programmed with full scale output with angles as narrow as 15° or as wide as 360° degrees. Output is selectable between Analog, PWM 12 bits or Serial Protocol (SPI) at 14 bits and includes a second output channel to provide a programmable switch signal. A redundant version with a dual core sensor in the same package is also available with the 6 pin Molex mating connector. A programmable switch is also offered allowing a switch output that can be triggered anywhere within the 360° rotation. The MTS-360 Mechanical Mount Rotary Position Sensor is ideal for a wide range of equipment including optical imaging stabilization and precision biomedical devices, optical zoom devices, consumer electronics, instrumentation, robotics, HVAC systems, automotive control systems, marine controls, fork lift trucks, farm equipment, cranes, unmanned vehicles, unmanned aircraft, industrial vehicles, low speed motor feedback, instrumentation, valve position sensors automation equipment position feedback system. • Robotic and automation feedback system. Robot arm joint sensor. Standard Non-contact displacement and position sensor. Customized Capacitive Displacement Sensors replacement.